Map of China during the Tang Dynasty. In yellow are the territories of China and the area of vassals and allies are in dark yellow. 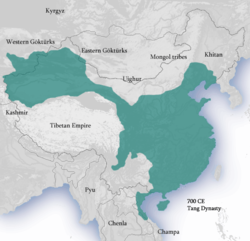 The Tang Dynasty (Chinese: 唐朝; Pinyin: Táng Cháo) (18 June 618 – 4 June 907) was an imperial dynasty of China that came after the Sui Dynasty and was followed by the Five Dynasties and Ten Kingdoms Period. It was founded by the Li (李) family, who came to power during the fall of the Sui Empire. The dynasty was interrupted for a short time by the Zhou Dynasty (周) (16 October 690 – 3 March 705) founded by Empress Wu Zetian who managed to claim the throne, becoming the first and only Chinese Empress. The Tang Dynasty, with its capital at Chang'an (today Xi'an), the biggest city in the world at the time, is considered by historians as a high point in Chinese civilization—maybe even greater than the earlier Han Dynasty—as well as a golden age of cosmopolitan culture. Empress Wu, the first woman to ever rule in China, was also included in the Tang Dynasty. Her methods were sometimes vicious, but she was very intelligent and talented. ↑ Taagepera, Rein (1997). "Expansion and Contraction Patterns of Large Polities: Context for Russia". International Studies Quarterly 41 (3): 475–504. doi:10.1111/0020-8833.00053. p. 492. ↑ That dynasty should be clearly distinguished from the Zhou Dynasty that began about 1050 BC. This page was last changed on 27 August 2018, at 02:44.